Bake-O-Glide™ release fabrics for lining baking trays / cake tins / dough & meats. 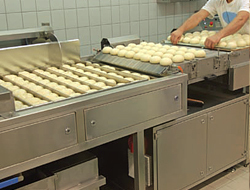 Process belts for freezing of meats / ice creams. Contact belt grills for meats and poultry processing. Silicone backed baking mats, excellent release properties even after long exposure to heat. Suitable for use in smokeries for curing fish.